Discount Forklifts carriages will save you 20 to 50% compared to new forklift parts. Discount Forklifts has many models in stock. 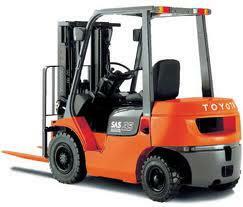 Most ITA including Toyota forklift parts, Nissan, Mitsubishi, Komatsu and TCM available (built from your sample). These forklift parts are available in standard and special widths. These specific forklift parts feature continuous welds for greater structural strength and meet or even exceed O.E.M. specifications and requirements.All assembles include load rollers and all carriages supplied less internal thrust rollers. Our rollers are lubricated for life and applied at a 2-degree cant to absorb forward and side thrust loads. We build over 1,300 different carriage bars for all forklifts and trucks. Price as low as 40% LESS than OEM!